For this small townhome, my clients wanted to maximize the seating in the living room, add storage and create an entry way – all without making things feel too cramped. We also needed to keep the traffic pattern in mind in order to keep the flow of their lives moving smoothly. From the front door, seen on the left of the floorplan, we keep traffic flowing neatly into the living room. We continue an open traffic flow into the dining room to the back patio door and around the stairway into the kitchen, as well as up the stairs to the bedrooms. 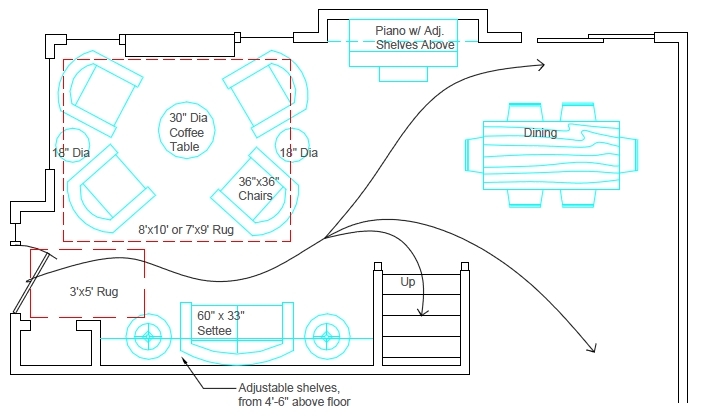 As you can see, the traffic pattern of the room can significantly impact the amount of space left over for furniture. While the living room may seem large, we were limited in the space we could use for a seating group near the fireplace, due to the traffic pattern of the room. That’s why it is so important to consider the layout of your furniture – and the traffic pattern – before building or remodeling your home. Room sizes may need to be adjusted to accommodate your needs – both seating and furniture needs and circulation or traffic needs. 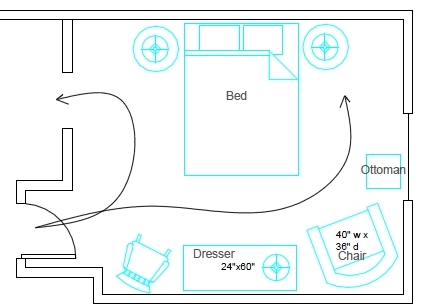 In a room with one entry point, such as the bedroom shown above, traffic pattern can be even more important. For this master bedroom, we needed to keep easy access to the closet (the door shown on the top left) and around the bed. The room has all the functions requested by the homeowners, but traffic still flows smoothly in and out of the space.